I bought the Extended Edition of Photoshop CS4 to create some 3D objects. Have you tried using those tools? Apparently, not many people have tried using these confusing tools. 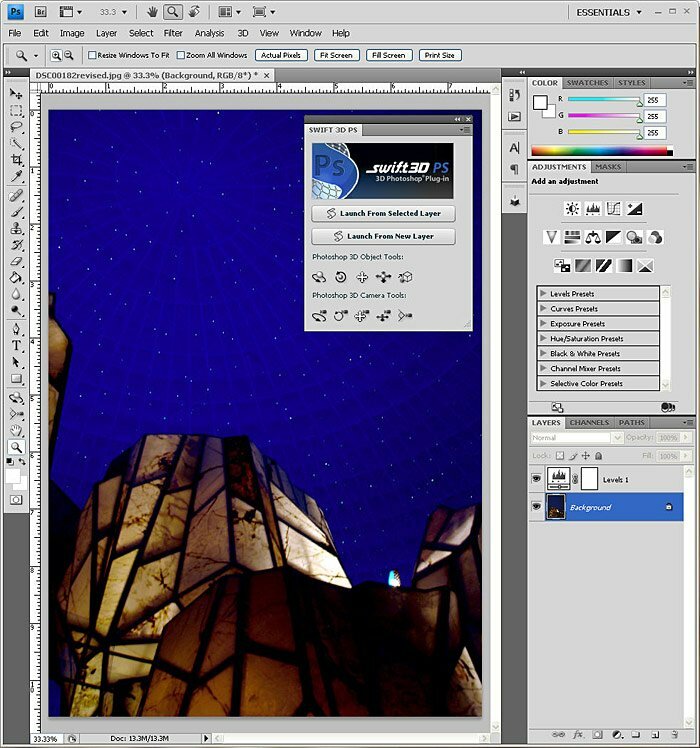 Of the new Photoshop CS4 books on the market, only Photoshop CS4 Down & Dirty Tricks by Scott Kelby even attempts to cover the Photoshop’s built-in 3D tools. But, even Kelby’s tutorial is tough to follow. Thankfully, Erain squeezed the latest version of Swift3D into a Photoshop plugin called Swift3D PS, available in both 32-bit and 64-bit. Once installed, Swift3D PS has its own panel located under Windows > Extensions > Swift3D PS. With a file open, simply click Launch from New Layer in this panel to open Swift3D PS. In the Properties palette, I selected the Bevel and applied the Beveled setting with a Depth of .010. Also in the Properties palette, I clicked the Materials to reveal the global values for the 3D text. 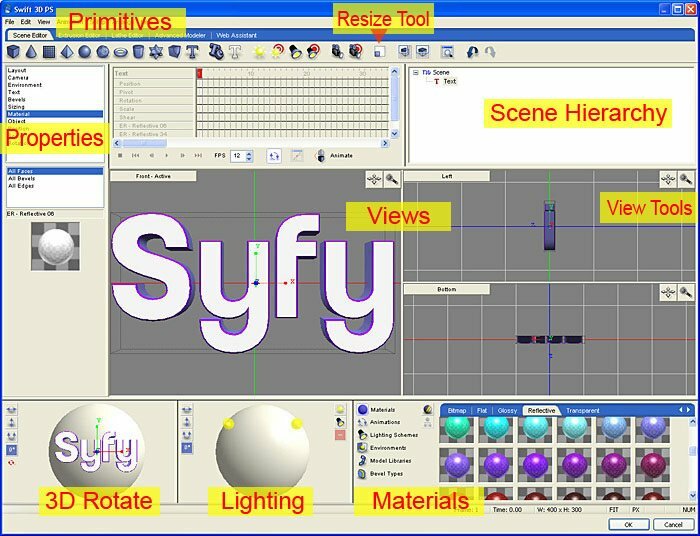 From the Materials Tab in the lower right, I clicked the Reflective Materials and dragged the White color to the front of the text (All Faces), the Purple to the bevel of the text (All Bevels) and the Light Purple to the Sides (All Edges). Click OK to complete. That’s it … pretty easy! Back in Photoshop, the Swift 3D object now resides on its own Layer. But, the view is wrong. Simply change the Position in the 3D Panel to Front to match the view from the Swift3D interface. I want the 3D object to appear on the cliff’s ledge. 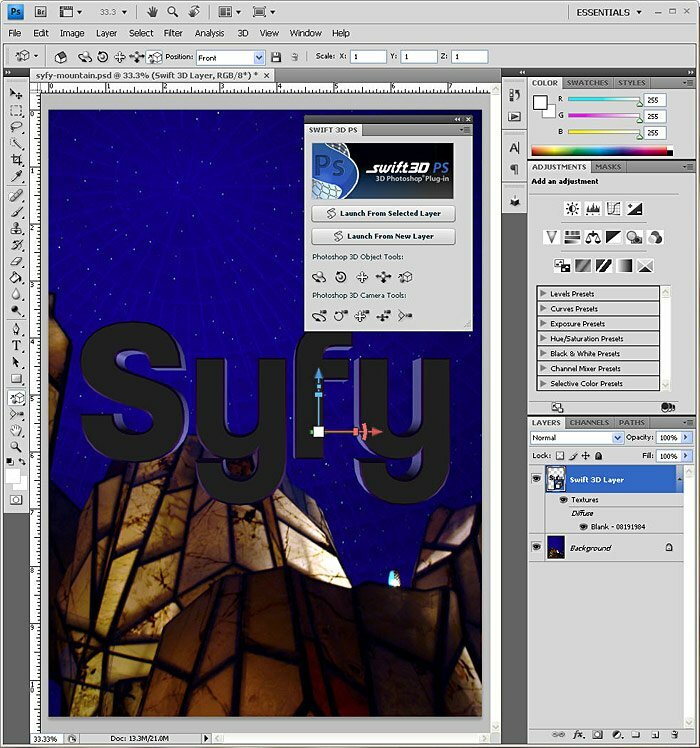 In the Swift3D panel, I used the 3D Object Tools to rotation and manipulate the angle of the Syfy text. Just one more thing for the 3D Layer. Under Adobe’s 3D Panel, I changed the Rendering Preset to Ray Traced and the Anti-Alias Setting to Better. 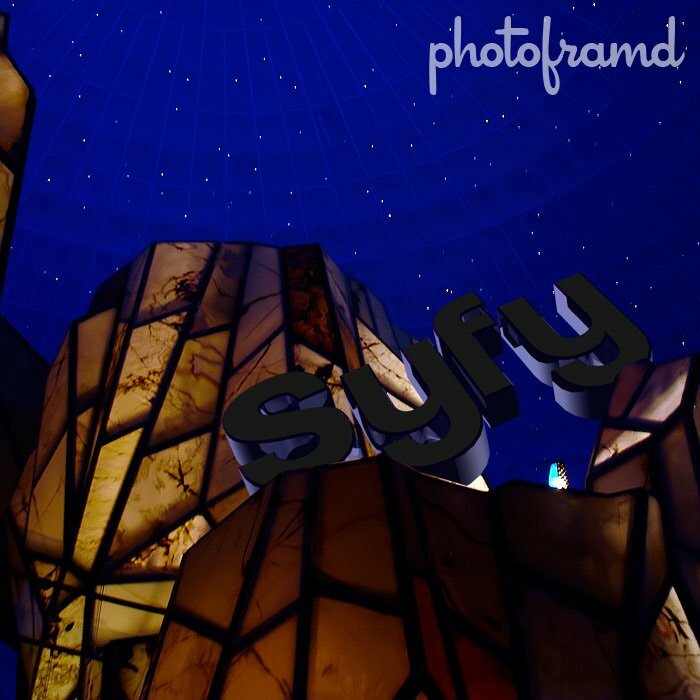 With the Syfy 3D text in position, I just need to mask part of the 3D object to make it appear like it is sitting on the cliff. By converting the 3D layer into a Smart Object, it can be manipulated just like any other Photoshop layer. Adding the Mask completes the look. NOTE: There seems to be a bug in the 64-bit version of Swift3D PS plugin when running on XP64. 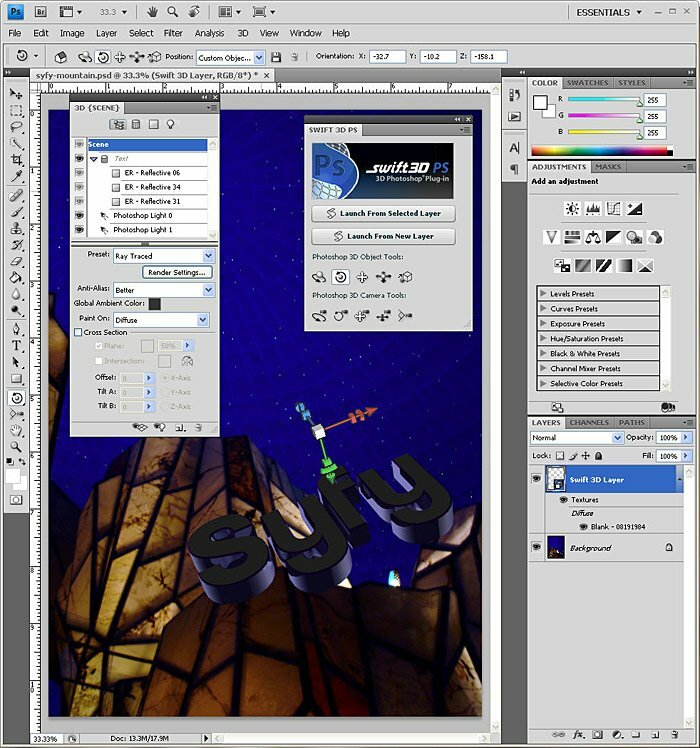 If the Swift3D panel is left open when Photoshop is closed, the panel remains open; this causes an error when Photoshop is relaunched which immediately closes Photoshop. The only apparent way around this error is to uninstall the plugin, and relaunch Photoshop. Swift3D PS can then be reinstalled. If the Swift3D panel is closed prior to closing Photoshop, there is no problem. I have reported this error to both Erain and Adobe. The 32-bit version of Swift3D PS does NOT have this problem. 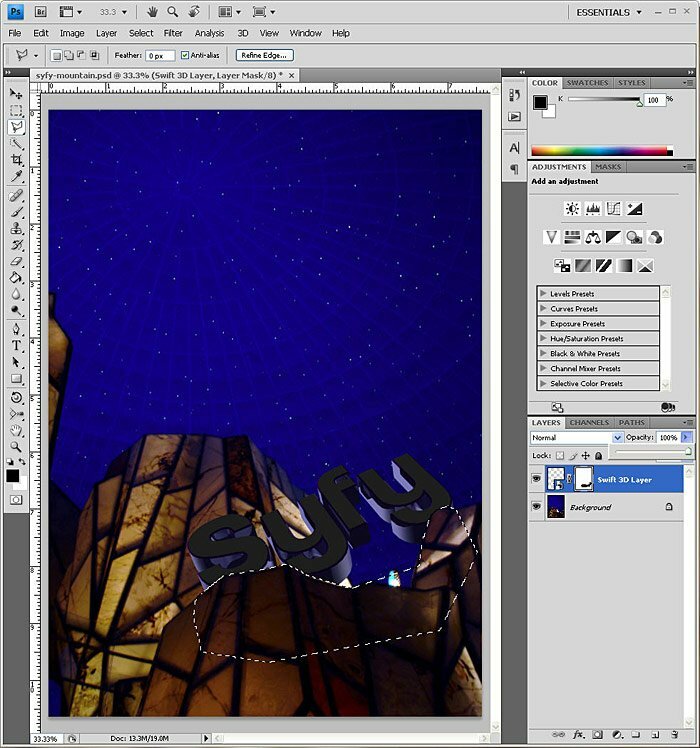 Look for Part 2 of 3D in Photoshop CS4 Extended tomorrow!